When I first heard about the Megabus sleeper service I must say I was intrigued. I’ve always preferred train travel to coach travel in the past. It’s usually more comfortable, particularly where night journeys are concerned. However, if a night bus service could provide a bed like they do in sleeper trains then it could certainly compete! Especially if they were able to keep the prices down and lower than a typical train journey to/from the same destinations. So what is it like? A bed on a bus you say! I should first point out that Megabus are currently trialling this sleeper service between Glasgow and London. Things may change in the future. However based on my own experience – over this trial period – I found there to be both upsides and downsides for the traveller who decides to use this service. I slept for 6 hours straight on the bus. For someone like me who finds it hard to sleep on night buses this was certainly an improvement. There bed was long, i.e. there was a lot of leg room. The beds are also well designed to keep the light out and the bedding was thick and warm. You also have little added extras like a socket for your laptop or phone, a bed light, and a croissant & orange juice in the morning. With each bed that is allocated you are also allocated a seat at the back of the bus too. It’s just like the seat you would get on a regular coach service. This means if you want to sit up and read a book with the light on you can do so without waking anybody up! The only major downside is that it is impossible to sit up in the beds and I can only assume this is why they have had to allocate seats too. There is very little height room. Even just lifting your head to try and turn sides was hard. On my return I found that there was more height room in the top bunks due to the extra curve on the roof of the bus, so my advice to anyone taking this service would be to ask for a top bunk! Megabus very kindly offered me my return trip for free for the purpose of this review, however, had I purchased this trip ordinarily it would have cost me 40 GBP each way. Considering you save a night on accommodation and you get a bed I think this is a very good price. Comparatively to a regular night bus service with Megabus, i.e. where you just get a seat and no bed, you’re paying around 25 GBP more per journey. Personally I think this is worth the extra money for one journey as getting a good sleep is so much easier on the sleeper service than is is sat in a seated position with limited leg room next to someone on a bus for 6 or 7 hours. What most people will probably be interested in however is the price in comparison to a typical rail sleeper service for the same journey. If I was to book a sleeper service with national rail for Friday 28th Jan, it would cost me 120 GBP. This is considerably more than what it costs for a Megabus journey. That being said, if you book well enough in advance by rail, and travel on selected promotional deals, then I have seen similar journeys advertised in the past by rail for as little as 16 GBP. Equally, I’ve also seen Megabus put on promotional deals for their sleeper service at 1 GBP a bed! I’m therefore not going to go by promotional offers as these might not be available when you attempt to book. Instead I’m going to take the average price for journeys from Glasgow to London, and for a one way ticket by rail it usually costs around 60 – 70 GBP at a few weeks notice. Based on this you’d make a saving of around 20 – 30 GBP on a Megabus sleeper service compared to the average sleeper rail journey of the same distance. What I like about the Megabus service in general compared to rail travel is that prices tend to stay relatively low. With rail travel it can yo yo greatly, and you really have to book well in advance to get a good price. With Megabus, or coach travel in general, it’s much more suited to the budget traveller who doesn’t like to book too far ahead, who likes to keep their plans flexible. I found the Megabus staff to be very friendly and helpful and never experienced any problems on either of my journeys. 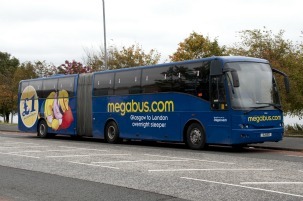 – If you want to book the sleeper service with Megabus between Glasgow and London and try it for yourself then you can head over to their UK site www.megabus.co.uk and make a booking. Cool! in the States I’ve only seen Megabus traditional coach service, but the sleepers are a cool concept I’ve never seen before. Sounds like a great idea. But no room to raise your head seems like it would be claustrophobia inducing. Did that bother you? I guess the thing to do would be to stay up in the seat untill you’re so exhausted you fall asleep as soon as you lie down. I’m not in any way claustrophobic so I it didn’t bother me so much, but I can definitely see that it wouldn’t suit some people. Surprisingly the bus is actually smaller in height than most coach services. If they just used a different type of bus I think they could definitely provide more height room for customers. Great to read a post where the writer has taken the trouble to find out the facts. Far more useful to a potential traveller than “I took the sleeper bus and this happened”. This does sound like a good idea. I took an overnight Megabus service from Newcastle to London once, and it was HELL – I don’t know how anybody on that bus got a decent night’s sleep. Especially as the bus broke down halfway and the driver was on his mobile all the time. If it was the cheapest option, I’d definitely take a Megabus that offers beds to its passengers. You’re right about the rail prices though – it yo-yos so dramatically (I’ve seen fares go up by almost one hundred pounds) whereas the buses don’t increase by that much. Thanks for sharing your review – I had no idea that Megabus were thinking of introducing this kind of service. 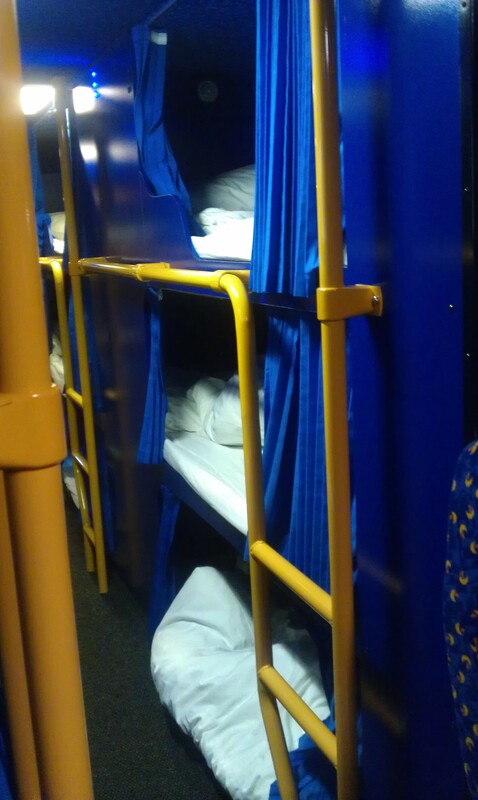 I traveled on the Megabus Sleeper last night from Glasgow to London. I had a middle bunk, bit of a job getting in, I’m over 6ft tall, however once in it was quite comfy. I charged up my mobile for the night and switched on the light and read for 10 minutes, got real sleepy and that was me. About 3.30 I woke up, I was quite warm and I made the mistake of kicking off my jeans. Not wanting to stand in my undies in the aisle, it took from the top of Finchley Road in London, right down to Lords Cricket ground to get them on again. I then managed to do a sort of limbo dance to exit the bunk. Ok, so not as good as the train sleeper, also a shame it starts in Glasgow and not Aberdeen or Dundee. But it’s nice to able to lie down and stretch out,sleep for the whole night and not wake up with a crick in the neck. I’ll do this journey again. Yeh I agree Dave. Getting in some of the bunks even for me at just 5ft2 is a bit of a limbo dance, but once you’re in it’s surprisingly alright. The sleeper bus layout has changed significantly. I wouldn’t recommend the bus with the new layout to anyone. You no longer get a seat & bed, only a bed nowadays, with the bed’s previous privacy now gone! a bed with no privacy – no thanks!! The new layout includes side by side single beds with entrance only from 1 side!!! With details of each stop shouted out over the tannoy every 2 hours, the unability to block out the glow from the street lights & the poor temperature control, It’s nigh on impossible to actually get a sleep! All in all the sleeper service is not what it once was. I along with my friends that were previous users of the services no longer use them. I am sure we are not alone. Just come back from a weekend in the Highlands via the Megabus Gold Sleeper from London Victoria to Inverness via Glasgow. This is a double-decker bus with its seats converted into beds – doubles one side, singles the other with stretcher type hammocks above the beds. I frequently take the Sleeper or seated overnight train for this journey so here is a comparison. The Megabus leaves london at 11pm which is later than I would like but makes it easier for people travelling from further afield and means the arrival time in Glasgow is not too early (06:30). You then have to get off, collect your luggage and wait for an hour until the bus is converted back to seating. The bus then continues to Inverness only stopping in Aviemore, arriving just before 11am. The train by contrast leaves at a more civilised 9:15pm and arrives at 08:35 giving more time for onward journeys. On the return Journey the bus leaves Inverness at 7:30 pm and Glasgow at 11:30pm after a similar hours’ wait, arriving in London at 07:20am. The train leaves later and arrives about 8am. Sleep? On the way north I found it impossible to sleep on the bus until it hit the M1 about 40mins into the journey. In Glasgow the bus only takes a few minutes to hit the motorway and I was soon asleep. I found my sleep interrupted by the bus making one or two stops and on the way up I think the motorway must have been closed for a section as the bus was turning and changing speed a lot. By contrast I find that on the train I wake up at every station and they are not few. Comfort. The seated carriage on the sleeper train has reclining seats with a fair amount of legroom so is a lot better than the seated bus. However it suffers from noise from the train and other passengers and a heating system that is either far too hot or far too cold at varying parts of the journey. In the cabins on the train the beds are comfortable, have adjustable heating and a warm duvet: take your own sheet in summer or in case the other passenger likes it warm. On the Megabus the lower beds are a little firm and the joints between the composing seat cushions can be felt. The provided pillows are a little on the small size but farely effective. A fleece blanket was provided which wasn’t quite warm enough at one point but too warm at others depending on the variable state of the aircon/heating. On the way back this weekend I was able to sample an upper bunk bed which is a cross between a camp bed and a hammock: material sagging slightly supported by two longways (horrizontal) poles. A bit like an old army stretcher. I found this very comfortable lying on my back but on my side I couldn’t bend my legs very far without hitting the supporting poles. Convenience. On the Megabus you are allocated beds by the conductor. He tries to allocate doubles to couples and otherwise separate the sexes. The bottom bunks have very little headroom where (in most cases) there is a hammock above and are quite a challeng to get in and out of without bumping the person above. The top bunks have a bit more headroom, less against the window, and have two-step ladders at one end. I managed to bang my head on the lockers when getting onto the hammock. Netting is provided to stop you falling out of the beds. This is on sprung belts so can be lowered for access. You have to be careful not to drop anything on to the beds below and not complain about being bumped from below in case you do! Luggage. Whilst the train has room for aircraft size carry on luggage near you and bigger items in the guards van, on the megabus all luggage has to go in the back of the bus. There is normally someone to load this but if not (as in Inverness) take care and mind your head. If you are less than six foot you might get a small daysack at your head taking care it doesn’t fall on someone or block the heating/aircon. Privacy. The only privacy available is in the Sleeper Berths and then only if you are travelling in pairs or buy a first class ticket. Modesty is best preserved by the right choice of clothes and perhaps a light sleeping bag or sheet sleeping bag. Facilities. Water Closet is an appropriate description of the toilet facility on the sleeper bus. It is a small walk-in cupboard with the requried facillities as found in modern camper vans (RV’s). It was however clean and functional. Those on the train are roomier but old and prone to malfunction, particularly in the seated carriage where there is more usage. WiFi. The Megabus has phone charging points and free wifi. Whats missing is a cradle to put your device as it charges while you sleep. The wifi did not always work being dependent on the signal recieved by the bus. The Sleeper berths on the train only have shaver points and I don’t think the seated carriage has anything. Also the 3G signal is very variable on the train. Lighting. The lights on the megabus are dimmed to just blue neons for most of the night. Even so I fared a lot better with an eye mask as given out (necessarily) on the seated sleeper train where the lights are not dimmed. All modes have reading lights for those insomniacs who don’t get travel sick when reading like I do. Price. Unless you are lucky to get a Bargain Berth ticket for the sleeper train then you are going to pay more than a flight booked at the same time. However, flights to inverness are not particularly frequent so the train may be more convenient. The seated sleeper is often available around the same price as the Megabus sleeper. Conclusion. If you prefer to sleep lying down rather than in a seat, are prepared to rough it a bit and are travelling on a restricted budget then the Megabus wins in my book. I will still try and get Bargain Berths or fly when I can but the seated sleeper train will be the last resort.